After going to conversation hour at the ESL center, dying eggs with all the amazing people who work there and who visit to work on their conversation I had the opportunity to chat with Johnny Yang a little bit about this project. He’s going to let us take over next friday to run the workshop, and things are really starting to shape up. In the last week I’ve had conversations with Saundra Wright, Matt Brown, and together Allison and I had the opportunity to chat with Ela Thurgood to hear their thoughts about our project and the ways in which we might go through with it. Saundra Wright recommended that we contact folks running the ENGL 130 classes including Seneca and Dalton so that we can advertise our event leading up to Friday so that we can try and get some good attendance. So far I’ve chatted with Dalton face to face, but I have yet to reach out to Seneca or any of the other 130 teachers. So this is part of my to-do list today before work if at all possible. Matt Brown spent an hour chatting with me about Walt Whitman and the ways in which his approach to the 1855 edition of Leaves of Grass might be Multimodal. There’s an image of Walt Whitman further down above the entry for April 8th. 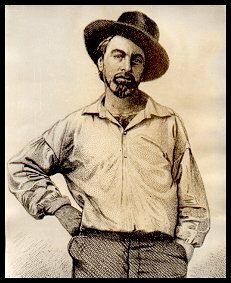 This is the first image you would have seen of the poet if you picked up a copy of the self-published edition of Leaves of Grass published in 1855. What’s interesting is that Whitman does’t always present himself this way, and that potentially the decision to present himself as an “everyday farmer sort” was actually more rhetorical in nature than a first glance might glean. Whitman is trying to make a statement about how this volume of poetry is not just for the Elite, but for everybody, including you. So he’s using technology to subvert a tradition of poetry that has existed in America since its inception, and that has roots in Europe. Multimodality in ENGL 431 is about challenging or updating the tradition of the Essay, and it seems to me their goals and messages run parallel to each other, and I wonder if a message similar to this existed at the birth of writing, or the birth of the printing press, or the telegraph, etc.. perhaps this technological bridge and the questions and frustrations that arise because of it are things we as a species are more familiar with than we realize having access to only a single lifetime. Johnny the special events coordinator at the ESL Recourse Center told me I could make a poster for the event, so I found a template on my phone, and in less than 10 minutes had a flyer that looked pretty good actually. I have no artistic skills, so all the work the app makers did to make the process easy and user friendly is very much appreciated. After sending the poster to Johnny for approval he had me change the text from ESL Center to ESL Resource Center, and so far this is the final product. What’s left to do after this leading up to friday is schedule a time to talk with Kim Jaxon and Chris Fosen about how to turn this whole thing into a “multimodal essay,” and to see if they can help me connect Walt Whitman’s work to the spirit of multimodality a little more clearly. And of course there is the workshop itself, and two separate linguistics tests this week… which is scary to be honest. So I’m starting to get this project narrowed down in my head. I feel like I’ve got traction, and I know who I want to talk to next. I recorded this journal entry before work while it was hailing outside, and posted it on break before chowing down…. so tech allows you to do some pretty crazy things. However, if this is supposed to be the kind of document that is both multimodal and does the kind of work an academic essay would do, it’s possible that things would become a little more formalized in the future. That being said, since part of this project is about documenting the whole processs being honest with the reality of how everything is coming together seems like a fair and justifiable move. I’ve reread Karen Karbiener’s introduction to the Barnes and Noble edition of Leaves of Grass; Walt Whitman’s most famous and most meticulously revised work, and I’ve asked her a few questions about Walt Whitman and his relationship with the cutting edge technologies of his day. My hypothesis is that Walt Whitman’s understanding of texts and circulation as well as of audience and purpose will place a few of Whitman’s actions and thoughts in the realm of Multimodal-equivalent. In 2017 we talk about multimodality one way, but in the mid 19th century maybe Whitman would have used a similar term were it in their lexicon. I hope to hear from her, but there’s no guarantees. I’ve been thinking more about compiling pieces of the project into a separate blog that we’d turn in when the project is due. It could have a separate page for both a kind of thesis statement, perhaps an abstract if we felt we needed it, and more important a separate page for works cited information. i have yet to ask Allison if she likes this part of the idea, but here’s hoping! leaf II has been added tonight. *Also if you want to see the original post scroll down. **Will add more and newer updates we go. For the final Multimodality project I’m upset that I can’t think of anything more technically savvy than a series of Youtube videos connected by theme and title, but that’s where I am. From what I understand this project either has to use multimodal techniques to design something that takes the place of a traditional academic text, or it has to be a project that explores the function of multimodality in academia with the purpose of trying to discover at least one way in which multimodality could be productive within the boundaries of a semester long class. I may have embellished this project a bit, but this is an angle that makes sense to me. Now this is the part where I admit I’m not really the most technically savvy guy in the world, but that I’m willing to learn. On wednesday we were talking about what kinds of ways you might grade or evaluate a multimodal kind of text, and to me this seems like a very hard thing to do. This class has spent a lot of time challenging formulaic writing, and it seems to me that the urge to formalize and confine multimodal approaches to the creation of academic texts would be counter productive, and we as a discipline would derive all the same problems we see currently in the teaching of formulaic writing that we see today. So what I think this will be is an exploration of Multimodality through the genre of a typical college paper like we’ve all seen a hundred times. In other places in the school I have heard my fellow English majors lament the difficulty of producing a paper in their Shakespeare or Chaucer classes that is both well researched and ‘in dialogue’ with the scholarship on the subject that has come before. The wordslinger was breaking a lot of conventions by doing that. In so many ways he dedicated his life to defying convention whilst simultaneously delivering true-depth with every attempt. Yes I may be a little biased. The point is Walt was anything but formulaic, and his message seems to be simpatico with the thesis of our class. So I want to explore the life and work of Walt Whitman through Multimodality. Which is my attempt at making Multimodality do the kind of work that a traditional paper might do. This would be my half of the project. On the other hand Allison Clark has expressed the desire to somehow incorporate our work at the ESL center into our project. Several times this semester she has reminded me, without trying to, that eventually we may have to teach these things to students in a classroom setting, and not only that, but we’re going to have to make these kinds of things useful to students. I fear that most often my approach to dealing with the subjects we’ve explored in this class have been from the vantage point of a student myself with the focus being how might these ideas be incorporated into my own process and style, where her’s has been more forward thinking in terms of how might these approaches benefit and alter academia as a whole (sorry if I’m putting words in your mouth Allison, but this is how you’ve helped me re-think these things over the semester). So it occurs to me that both might be good things to explore. Film the project from start to finish like a documentary. Film brainstorming sessions about the project so that we can document our process and they way in which the idea for whatever the final product turns out to be was born. Speak with Saundra and Johnny and see if we can create a Walt Whitman workshop-ish thing that we can advertise and get people to show up for at an ESL conversation hour which takes place every Friday at 4 or 5 pm. So I thought it would be cool to show people some good passages of Whitman, maybe paired with some images of nature and the diversity of people who live here and make of America (Humans of New York would be a cool resource) since diversity as an American theme seems to have a universal appeal in most cases. After the little pre-activity we could ask the participants to come up with a few of their own “I am statements” then have them read their statements together. The hope being that was as a group can arrange the statements to create our own leaves of grass styled poem with statements generated by our ESL students and tutors. With their permission they will allow us to film it and use that for our final project. I’d also like to film/document conversations with Allison about the project, and some of the conversations we will have to have with our profs to pull this workshop off. Finally I think this whole thing might culminate in a short reflective essay that will be posted on a blog somewhere. In fact, just brainstorming here, it might be good to put this whole thing on its own blog so that the blog itself could be the final academic text. Allison this is mostly for you and Kim. I’d love to hear your thoughts, and if you have any questions or concerns please shoot me an email or give me a call. ← What in the world… Why am I up at one in the morning writing my assignment. I am completely on board with this idea. I think it’s such a smart approach. And I think you’ve done a much better job than I have exploring the purpose of the assignment: ” From what I understand this project either has to use multimodal techniques to design something that takes the place of a traditional academic text, or it has to be a project that explores the function of multimodality in academia with the purpose of trying to discover at least one way in which multimodality could be productive within the boundaries of a semester long class.” Let’s make sure we share this with the class because I think you’ve captured the goals so well here. I think creating your own WordPress site where the pieces of the text can live would be a cool way of organizing and sharing the parts. I also like the idea that this means the reader can jump in wherever she wants to OR you can guide a reader/viewer. Setting up a WordPress site is relatively easy and I can help too: https://wordpress.com/ (make sure you choose the free one). I am particularly excited by the possibility that you would document the process and include that with the project. Finally, I think you’re on to something with Whitman…in some ways, you’re reminding me that breaking the rules with multimodal approaches can also be a subversive act. Very excited about the project. There is new stuff on this post as this project has been developing, and I think there’s going to be even newer stuff on this post before today is over. I like the ice of the wordpress blog format, and was hoping you might have some ideas about how Me and Allison might arrange the information we are collecting. The only thing I know for sure is I’d like the Blog to have a page that would take the place of a traditional works cited page for an essay, and another page that has acknowledgments so we can recognize all the people who have helped us put this thing together, but other than that I’m not exactly sure where to begin.